The Island of Hawaiʻi has much to offer. Enjoy nature with access to the breath taking active volcano, black sand beaches and many hiking trails. This guide covers the south-east side of the island of Hawai'i. Please remember to tread lightly, and be mindful of your impact on our natural environment. For additional questions on the island of Hawai'i, please feel free to send us your inquiry. This oceanfront Japanese inspired garden is perfect for all ages. Paved sidewalks and open grassy areas are great for picnics, strollers, and running. Tip from a local: Utilize lemongrass or peppermint doTerra essential oils for an all natural bug repellent. Take a quick 7 minute drive from the Hilo airport to view these 80-foot waterfalls. The viewing platform is safe for all ages, however we advise you not to hike down the hills to the waterfall itself, this area is known for flash floods. Tip from a local: Bring a camera! Black sand and cool waters; this is what we love about the island of Hawai'i. Tide pools and calm waters make this a family friendly beach. Tip from a local: do not leave valuables in the car. Whether you're an avid back country hiker, or need a leisurely hike; there is an option for everyone at the Volcanoes National Park. 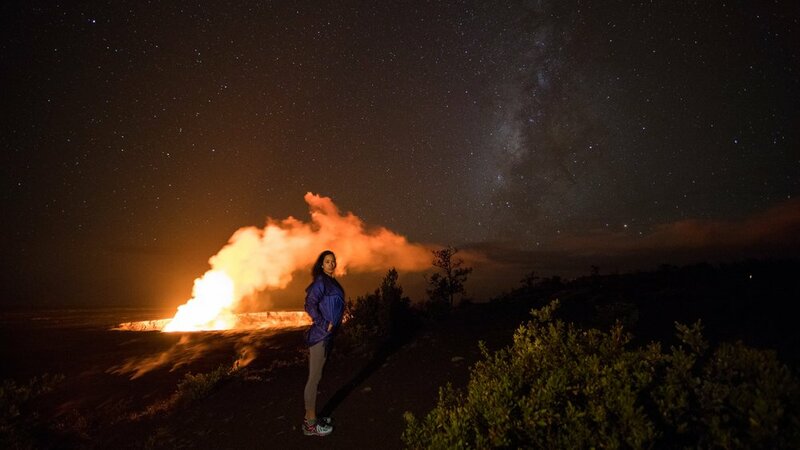 Tip from a local: make reservations for Volcano House. Parents - bring a baby carrier for children ages 0 - 2 years old to explore Thurston Lava Tube and some of the crater hikes. This vineyard offers wine tastings from 10 a.m. - 5:30 p.m. daily, except for Christmas day. No reservations are necessary. Tip from a local: send wine home via their shipping option and sip on vino that reminds you of your escape to Hawaii where ever you are in the world. Drop in for a class, or pick up a unique piece for your home. Tip from a local: check the art schedule and make a class reservation for children and adults to enjoy a hands on experience. Known as the Valley of the Kings, Waipio carries a sacredness and is a unique spiritual place for the native Hawaiian people. Tip from a local: Try a horseback tour for a memorable experience in or around the rim of Waipio Valley. This .04 mile hike on paved sidewalks leads to a view of one of the most majestic waterfalls on the island. Tip from a local: bring a picnic and a baby carrier for children under 2 years old. We love the Ergo, which gives support to both baby and the parent. Cute boutiques, antique shops and restaurants make up Honoka'a. Tip from a local: plan a day trip and include Waipio Valley, but check open times and availability for stores and restaurants. This quaint town shuts down early and many shops are closed on Sunday's. Lush, native Hawaiian flowers ake this rare botanical garden a treasure. Tip from a local: send home some of these beauties with their "ship a bouquet" option.